If you live in the U.S., chances are, you’ve tried jungle juice. Lots of alcohol, lots of fruit, and naturally, some juice. You’ll see this classic drink all over college parties, music festivals, tailgates and more. But would you believe me if I told you the boozy punch originated during WWII? 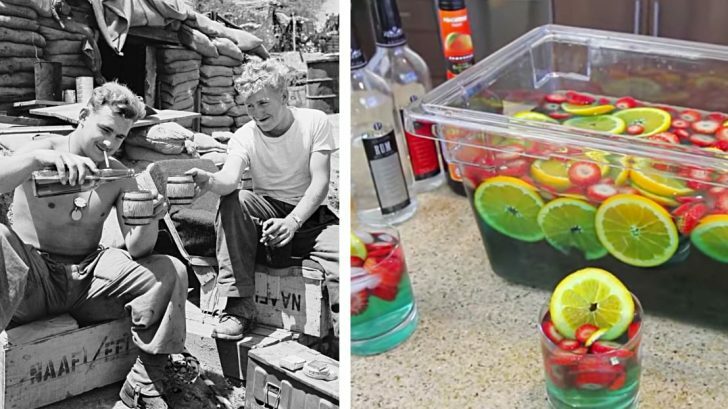 That’s right, jungle juice was created by WWII soldiers. During WWII, soldiers were often deployed to the Southwest Pacific, but didn’t have access to alcohol. In the jungles abroad, soldiers wanted to keep sobriety at bay, but The United States did not give soldiers alcohol. As Americans do, the soldiers decided not to go without. They just made their own! Looking around the jungle, the soldiers would grab fruit or any other sugar-based thing they could get ahold of. The result? Usually a 100-proof rum-like punch. Lemonade and other sweet drinks would be mixed with this so the soldiers could have a party whenever they wanted. With that, the United States’ favorite party beverage was born. Needless to say, most people don’t make jungle juice the traditional way anymore. So how do you make jungle juice nowadays? Jungle juice is generally a combination of grain alcohol, juice, and fruit in any container that will hold it. This stuff is definitely for a crowd. The liquor-soaked fruit is great to snack on while drinking. It has it’s own punch and will help with the party, but it’s something completely different on its own. Need to find a recipe to make your own from? Try this recipe by the Tipsy Bartender YouTube channel, and get the party started!